With the cold weather, my husband and I have been spending more time indoors. This also means that Reya is almost entirely indoors as well – leaving us with a very wild, large dog running happily across the house. In the end, this leads to humans with cuts, bruises, and sometimes achy joints from running up and down stairs constantly throughout the day. Along with exercising, I have been one sore blogger! Luckily, right before all these winter storms started, Zim's asked if I would review some of their new products! To say the least, they were a very welcome addition to our household and we were excited to start reviewing! Looking for a cream to help relieve temporary pain caused from achy muscles and joints? 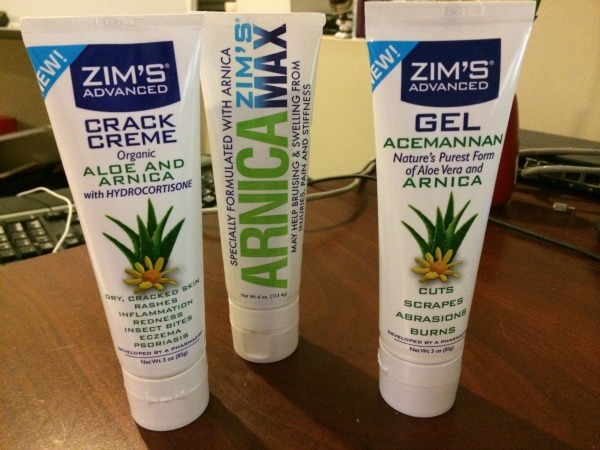 If so, you will love Zim's Arnica Max cream. This cream is specially formulated with Arnica to help relieve pain caused by backaches, arthritis, strain, bruises, and even strains. In other words, this is a perfect cream for just about everyone, including athletes! Just gently massage into your skin and feel the pain start melting away. I personally tried this cream for neck tension and was very impressed with the results. While it may not smell the best, it is still a very good product, giving it a Budget Earth A rating. 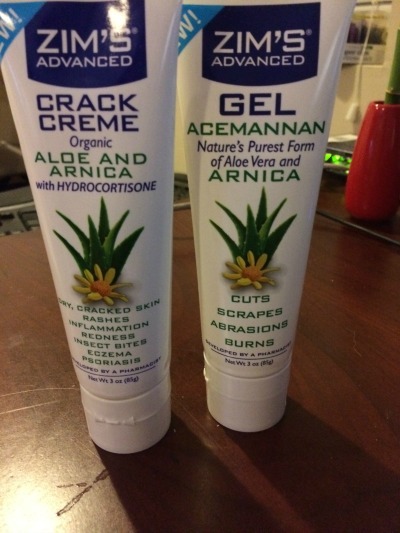 To test out the Zim's Advance line, Zim's sent me two of their products – the Gel Acemannan and the Crack Cream with Organic Aloe and Arnica. Both of these products feature aloe vera and arnica, allowing your skin to feel even better and heal faster. What really impressed me with the crack creme is that it included hydrocortisone, making it a great way to ease pain caused by insect bites, rashes, or (as the name suggests) cracked, dry skin. While I, thankfully, wasn't able to use these products heavily, when I needed them they did provide great results, giving me a bit more comfort during this horrible, dry winter weather. So far, they seem amazing, just like other Zim's products I have tried in the past! Based on my experience with the Zim's Advanced line, I am happy to give these products an A rating as well! Would you love to try products from this new line of Zim's products? You can purchase Zim's Arnica Max and products from the Zim's Advanced line from Wal-Mart, Target, Walgreens, CVS, and Rite Aid. If you cannot find a certain variety in your area, don't forget that they are also available on Amazon.com! I am 66 and have very uneven skin and find myself going out as little as possible in winter because dries it out even more. Would love to try this, please, and thanks!! Sounds good, I'll have to try it! I truely truely believe that this would help me and my arthritis.My dad had arthritis so bad in his hands. The funeral director said that they never seen hands as his because of his arthritis. I wish I had the Arnica Max cream right now, I fell fown the stairs yesterday and could really use it! And the crack cream would really help my fingertips that are cracked and painful right now. 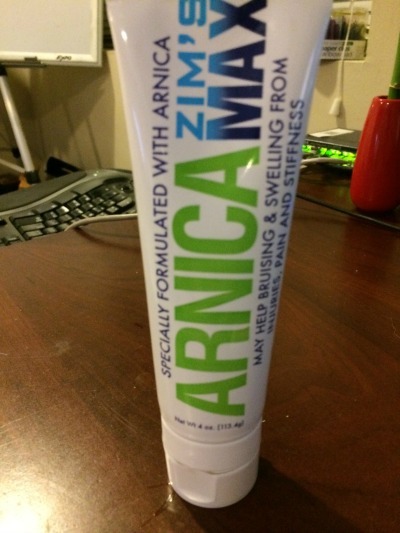 I love Arnica….that stuff has magical powers or something! This product could really help me with my dry itchy skin. I have not tried the Zim's products, but I would like to. I need to get some of these amazing products! I am always looking for new pain relief products to help me and according to your review it may not smell the best but you found it worked well for you. Hopefully I will win so I can try it soon. This stuff is good. I used to use it when I had to be outside a lot and my hands cracked and bled. sounds like it works great. i will read a little more about it and see if i can get a sample and try it out. thanks for the review. I have extremely dry skin during the Winter and it is a fight with feet and hands cracking and thin skin that tears easily. Also, the Winter months bring on the achey joints. It Looks like Zim's has a product for all of my issues and I can't wait to try their products for relief of the Winter months ailments! I think I would enjoy the Zim's Crack creme for relief of exterme dry skin in the Citrus Scent! I bet these could help me! I have psoriasis (bleeding, hurting, itching cracked skin – yuk!) I also have the psoriatic arthritis that goes with it. Kind of the gift that keeps on giving! I would love to see if these products could help – if you give them an A rating, that's good enough for me! My hubs is always complaining about his back being sore after work. I think this might help him a bit. This would be great to try since I suffer from arthritis that bother me alot and it would be great if it helps my wife's back problems. I have heard great things about this product. Never heard of that one and will look at the stores listed, interested in this with the hydrocortisone, thanks for posting .